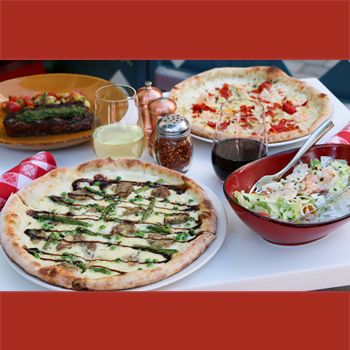 Flour & Barley pairs two great items: gourmet pizza and craft beer at the Linq Promenade. Flour & Barley pairs two great items: gourmet pizza and craft beer. At their flagship Las Vegas restaurant located at The LINQ Promenade, they bring a modern twist to this classic combination. From original pizzas made in their signature brick-ovens to fresh salads, paninis & pasta dishes, this trendy eatery even offers a cool patio to hang out in. Get 25% off your entire check with your Tix4Tonight dining card.